Double sunset clip. You need Quicktime in order to view the following clip. This video sequence was taken on February 5 well after the official sunset calculated to be 14:38 local time. Shortly after sunrise and before sunset, two suns, or the projection of two sun disks were seen. After sunrise the two suns were outstanding, however video taping this effect was not very successful.All throughout February 5 , the sun disk was always below the horizon. The two suns were generated by two physical aspects of the atmosphere, refraction and a rather large temperature inversion. At First in the morning the refracted sun showed up, along with its really jagged aspects given by the compression of the sun disk. The temperature inversion caused a second sun disk to appear a little later, a huge jagged sun was above a smaller rounder one. After gaining some elevation, the two suns merged into a rounder one. Later, well passed the official sunset estimate time, the reverse scenario materialized, the horizon was clear but hazy with perhaps some clouds, the sun appeared orange and bright, unusually bright, not long after the merged sun images split in two again, while the inversion sun set first at about 15:03 local time, the refracted sun disk persisted until about 15:23 local time. Distinguishing the two is easy, the inversion sun appears rounder and smoother, while the refracted sun appears distorted and much weaker especially at sunset. The refracted sun penetrates a very thick layer of our atmosphere, while the inversion sun is created well to the South of Resolute Bay, its light travels through a much thinner atmosphere, hence it appears brighter. This is part of the double sunset about 1455 local time, the duct produced a Novaya Zemlaya bright light, the rectangular sun is far brighter than the refracted sun in the background, this effect did not last too long. Turns out that my initial analysis appears closest to reality after all. The refracted sun in the foreground spawns another image, which wipes out the source image. It is a simple concept yet it looks complicated. The inversion layer on February 5 was steep and shallow (in the morning LPR = +0.086 at 94 meters, in the evening LPR= +0.05 C/m at 150 meters). This created a duct about 0.2 degrees high, somehow the ducted sun appeared brighter than the refracted one, since then several more observations have shown this to be so, ducted sun light is always brighter. Part of the duct light geometric sequence was a Novaya Zemlaya effect as captured on 35 mm picture . The foreground-refracted sun is red on another 35 mm shot, filmed a few minutes before it appeared to set at about 1520 lt. What is remarkable is the apparent cancellation of the refracted sun image by duct appearing right in front. -Visual observation contradicted the pictures a little. This Fire on Ice 35mm capture was typical for March 2001. 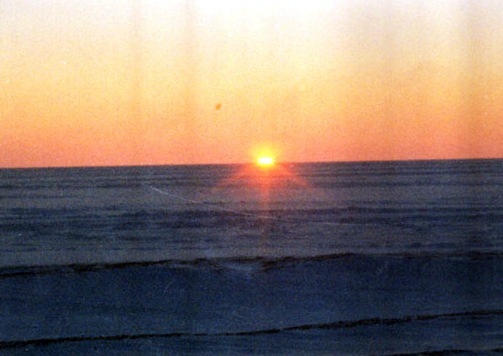 Note the missing red line (refracted sun) on the preceding picture above, this implies an above the horizon shallow duct present during the entire double sunset sequence.